Birth control regulates my period, makes it punctual: every twenty-six days, I bleed. That also means that around the twenty-fifth day, I fight off my worst demons. I struggle with premenstrual dysphoric disorder (PMDD). Often referred to as “PMS on steroids,” its severity is belied by such offhand references. Professionals estimate that 3-9 percent of women suffer so greatly from PMDD that their daily lives are compromised—only the onset of menstruation signals relief. It’s no surprise that this condition, found in the DSM-IV, is often confused with bipolar disorder. 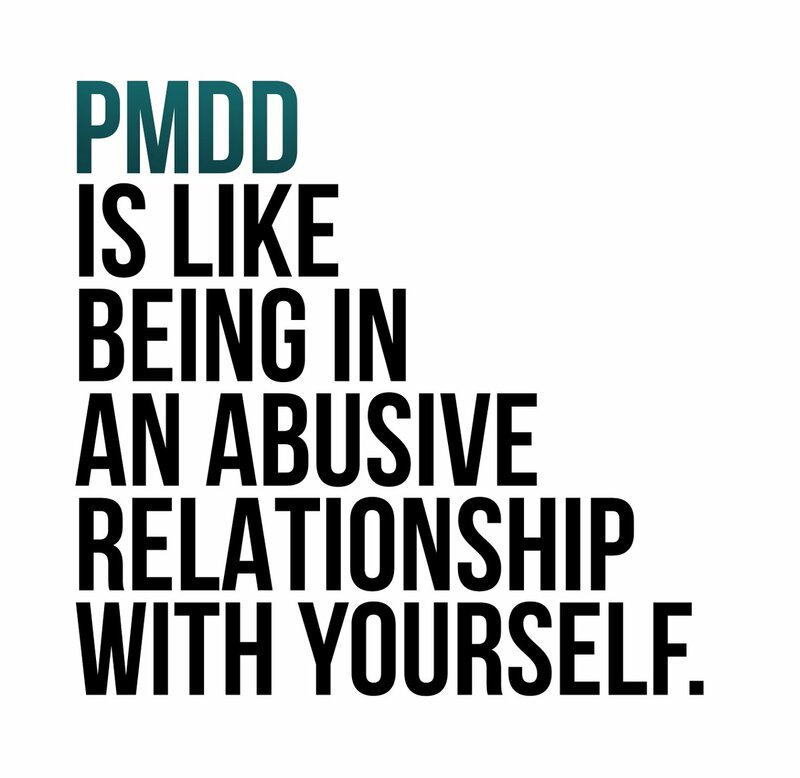 I recently came across a meme online: “PMDD is like being in an abusive relationship with yourself”. I was taken aback by how apt that statement is. For years, both my own clinical depression and mistrust of the medical industry dissuaded my understanding of PMDD. It wasn’t until after my daughter was born that its symptoms became so severe that I realized there was a cyclical and predictable pattern to my inability to regularly function. As someone with endometriosis and ovarian cysts, I’m intimately familiar with the debilitating physical pain my period brings, but that’s no match for how PMDD causes me to feel inside. On the day before my period starts, my body aches and feels devoid of energy; my mind feels tortured, on fire, so full of vicious rage and hopelessness that it physically pains me. Moments that would normally make me smile take on a dark turn: a tender hug from my child and her inquiry “Will we always be friends?” signifies a future where she and I are estranged. While everyone and everything can be a prospective irritant during PMDD’s grip, I am the primary target of my wrath. I lock myself in my bedroom as a precaution. Every problem I have is one I’ve caused, one I shouldn’t have been so stupid to elicit. When I think of my loved ones, all I can see are the ways I’ve let them down. I scan through my problems and believe I am the common denominator. A running list of reasons I am unloveable flash through my mind—from being molested by my older brother as a child or never fulfilling my aunt’s wish that we watch “The Sound of Music” before she died to the prospect of having to apply for food stamps again. But what ultimately breaks me is the thought that I have nothing of worth to offer my daughter, that she will ultimately find out the truth about me, that she will one day see me as I see myself. The sole comfort I have at times like this is one I keep tucked away: this will not last. It will go away. Yet because as sure as it leaves, it will return the following month, it’s both my talisman and my terror. I sometimes rely on notes written to myself during times of stability. “Remember that this will pass,” one reads. “Your feelings are not the truth. This will pass. It always does.” My iPhone brims with so many pictures of my daughter that I need an upgrade for more storage. The one I reference most—when I am in the grips of PMDD and feel terrified I have ruined my daughter’s life by virtue of being her mother—is a screenshot I took of a FaceTime conversation we had one weekend. Both our faces are partially obscured, neither of us look particularly photogenic, but we are both radiant with joy. It’s the moment our call connected, and we are both elated to see each other. It’s evidence of a moment I can’t always trust my brain to recall. It’s an image that disproves everything my brain screams at me directly before my period begins: I have worth, value, and happiness—I deserve all of its goodness and more. I hope that by continuing to fortify my treatment with palpable items, I can learn to hold onto the truth beyond the notes and pictures whenever PMDD takes hold.